There are many touching stories throughout America on a daily basis that simply are not considered “newsworthy enough” to make headlines. They are stories which show our strength as a people, and bonds that can form between individuals of different races, cultures and religions, if we are willing to open our arms and our hearts to someone who may speak a different language than us or have darker skin than our neighbors. KrassenCast is a new podcast by the co-founders of Hill Reporter, Ed Krassenstein (myself), Brian Krassenstein and James Kosur, and it focuses on sharing some of these amazing stories of perseverance, love, and humanity. In the latest episode of Krassencast, entitled ‘Asylum Camp Nightmares That Trump Won’t Tell You,’ we interviewed a registered nurse from San Diego, who went down to Tijuana, Mexico and formed a tremendous bond with a female asylum seeker named Yaritza. The entire interview and podcast is now available on Patreon, iTunes, Soundcloud, Youtube, and other podcast services, and it can be heard below. Gretchen Gordon is a registered nurse in San Diego, California. She is one of many volunteers who cross the border to Tijuana on a frequent basis in order to work with women and children who are seeking asylum in the United States. During one recent visit to these asylum camps, about four weeks ago, Gordon met a woman who had been through a tremendous amount of trauma. Her name was Yaritza, and she had left Honduras after her husband was murdered by a gang or cartel. During her long journey north to Tijuana, she had been kidnapped by a group of men who almost killed her. Upon getting to the shelter, Gordon met up with her. She was ill and needed some basic medical care. 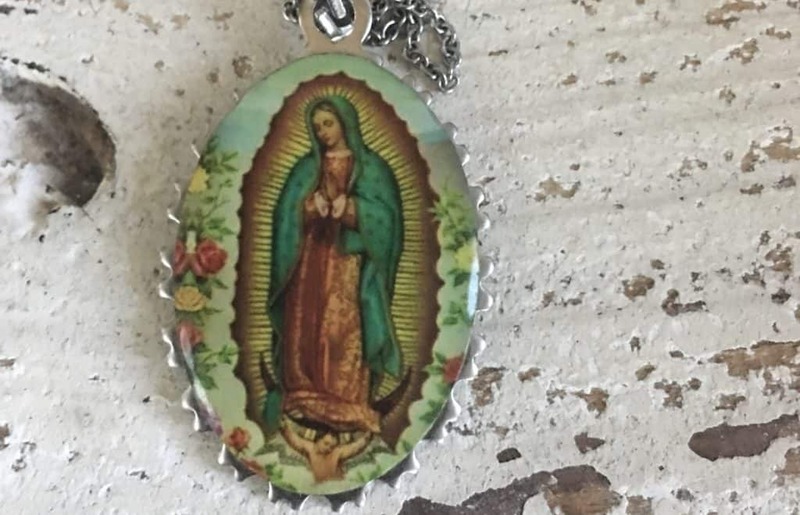 Before Gordon left Tijuana to head back home to San Diego, Yaritza gave her a Mother of Guadalupe medal that she had brought with her on her journey from Honduras. Gordon reciprocated the favor by giving her the earrings that she had worn down to Mexico. The two didn’t know if they would ever see each other again. The medallion that Yaritza gave to Nurse Gretchen Gordon. Then just a little over a week ago, Gordon made a return trip to Tijuana to again help out with the asylum seekers in need of medical care. Gordon and Yaritza just embraced each other as tears streamed down their faces. According to Gordon, Yaritza is still awaiting her asylum hearing. She’s in the process of waiting for her ‘credible fear interview’. The entire interview with Gordon, where she touches on some of the other inconceivable things being done by the Trump Administration at immigration detention centers in San Diego, as well as more on this story, is now available on Patreon, iTunes, Soundcloud, Youtube, and other podcast services.